GearDryer Floor Free Standing 6 pair model. Whether from snow, rain, or your own sweat, gear often ends up wet after big days spent playing and working outside. Without a forced-air drying solution, the enclosed spaces in boots and gloves can remain damp for days on end. And wet gear is cold gear. The GearDryer Freestanding 12 Boot and Glove Dryer delivers more than 200 CFM of forced airflow—heated or ambient—to quickly evaporate and remove the moisture, allowing you to start every day dry and stay warm. 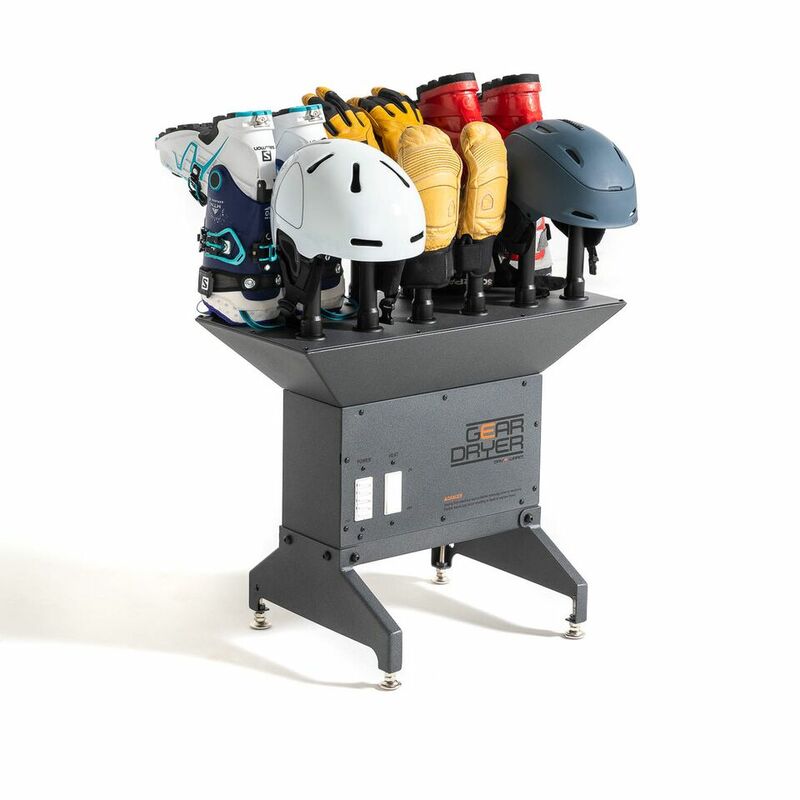 Whether you’re skiing fresh powder, riding snowmobiles, working tough job sites, playing hockey, or dealing with sweaty sports shoes in the summer—GearDryer is the ultimate boot, shoe, glove, and gear drying solution. The most important factor in effectively removing the wet and sweat from the enclosed spaces in boots and gloves is a high volume of forced air. Delivering more than 200 CFM of airflow, GearDryer is one of the most powerful drying systems available. Plus, GearDryer gives you the ability to dry with heated air simply by flipping a switch—speeding up dry times even more. Other drying systems dry with only ambient air or only heated air. GearDryer is unique in that it gives you the option to choose. GearDryer uses a special self-regulating heat element that increases the air temperature approximately 25ºF above the ambient air temperature. This gentle heat increase is safe on gear yet effectively speeds up dry times. GearDryer also features 5 pre-programmed dry cycle settings. Simply select a 15 minute, 30 minute, 1 hour, or 2 hour dry cycle. To initiate a 24 hour dry cycle, hold the 2-hour button for 3-seconds. Geardryer automatically shuts off after the completion of a dry cycle, allowing you to set it and forget it. 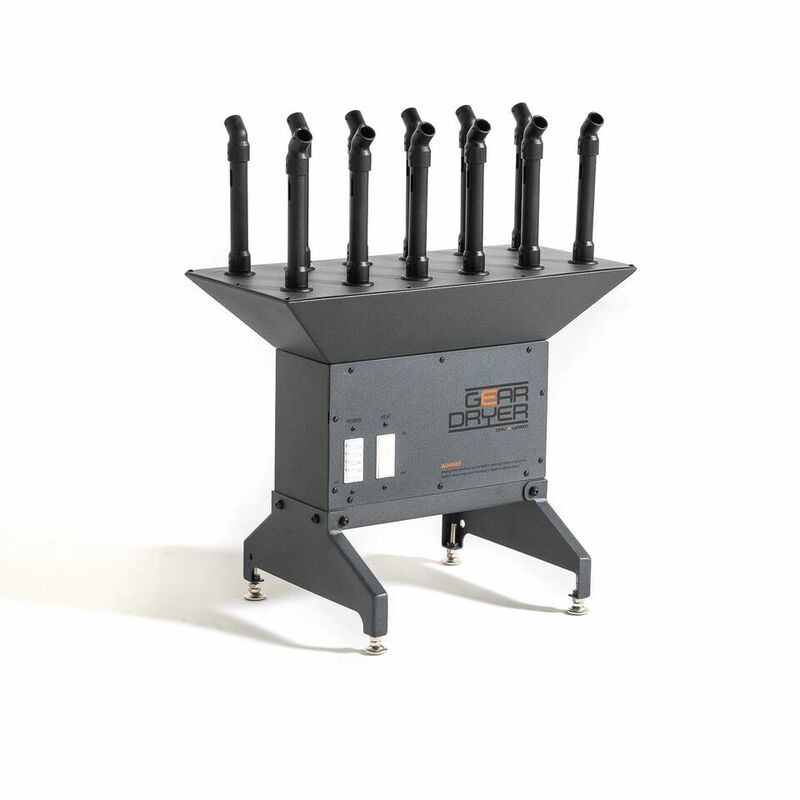 The Freestanding 12 Boot and Glove dryer features 12 individual dryer ports that can accommodate up to six pairs of boots or gloves. 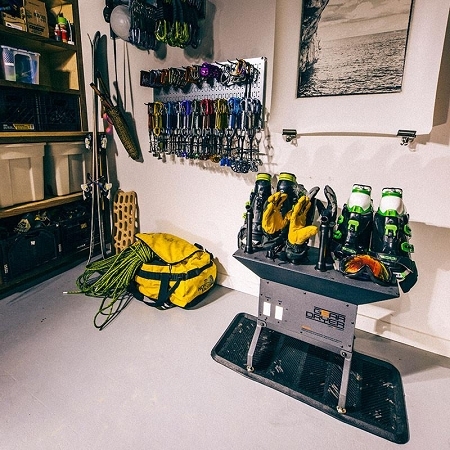 GearDryer’s unique twist and lock port design allows you to customize the port layout to create the perfect drying system for a wide range of gear items—whether you’re drying sweat soaked running shoes, ski boots and ski gloves, work boots, and even fly fishing waders. The Freestanding 12 also includes 6 port caps to close off the dryer ports not in use—increasing the airflow in the ports being used to dry gear. 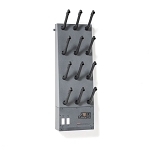 The GearDryer Freestanding 12 Boot and Glove Dryer plugs directly into a standard wall socket, is made from heavy-duty steel with a durable powder coat finish, and includes leg levelers to ensure stable placement on the floor of your gear room, mud room, garage, or entryway. When we developed the GearDryer drying system, we chose the name GearDryer because the system is versatile enough to dry an unlimited range of gear items. 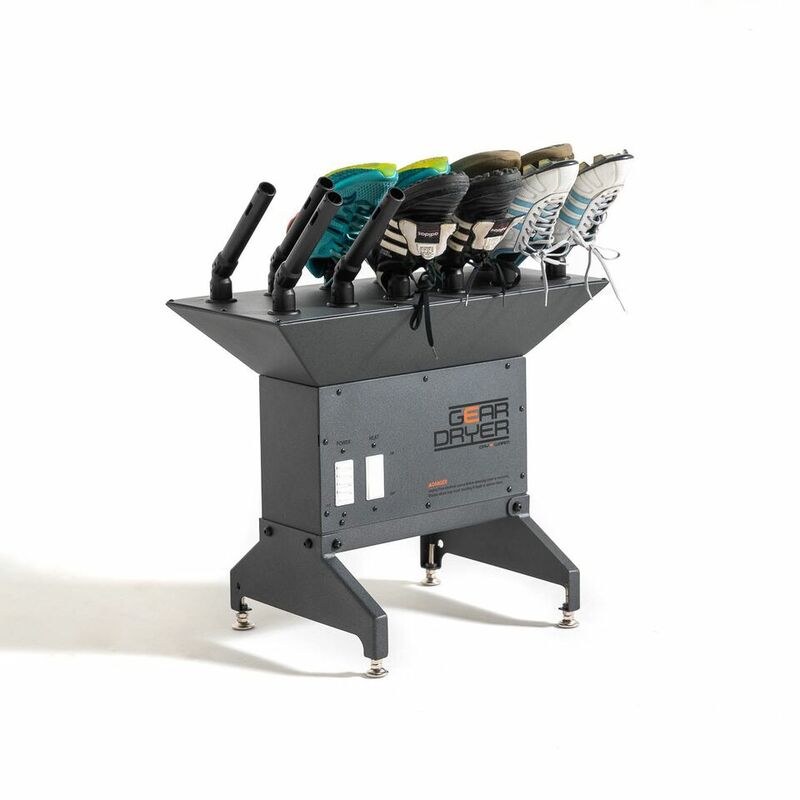 GearDryer is a ski boot dryer, a snowboard boot dryer, a ski glove dryer, a helmet dryer, a hockey skate and glove dryer, a soccer cleats dryer, running shoes dryer, mountain bike gear dryer, fly fishing waders dryer, moto gear dryer, and the list goes on. If you have wet gear of any kind, we’re confident that the GearDryer system will get the job done right. We believe that having the right tool for the job goes a long way, and that’s true whether the job is making fresh tracks on a powder day or putting in long hours at a construction site. Making the investment in good gear that performs is always worth it. 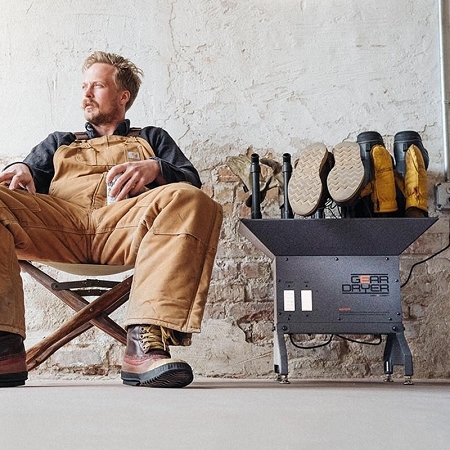 That’s why we built GearDryer—a boot and glove drying system that really gets the job done. If you work hard and play hard outdoors you know the value of good gear, and when you need to dry that gear after a big day, you shouldn’t have to settle on a cheap, plastic boot dryer with weak airflow. We built GearDryer for you, because you demand gear that performs. To keep it simple, we’re just some good ol’ Utah boys. We like to ski powder, ride mountain bikes, climb rocks, and camp under the stars. We cut our teeth in the outdoor gear industry, working with outdoor professionals and chasing our own passions outside. We know the value of good gear firsthand—whether it’s our bikes, skis, or climbing gear—having equipment that performs day in and day out is a necessity. During our design and development process, we found the single most important factor in the performance of a boot dryer is the amount of forced airflow that is directed into boots and gloves. With more than 200 CFM of airflow, our GearDryer puts out more airflow than most of the high-dollar commercial systems, and puts the cheap plastic dryers out there to shame—it’s not even a contest. We also built in the option to dry with heated or ambient air—this seems like a no-brainer, but GearDryer is one of the only systems available that gives you the choice. On top of that, we designed the airflow ports to be modular, allowing you to direct airflow into gear and customize the port layout for specific gear drying solutions. Finally, we designed the GearDryer to look great in your home, mudroom, or garage. 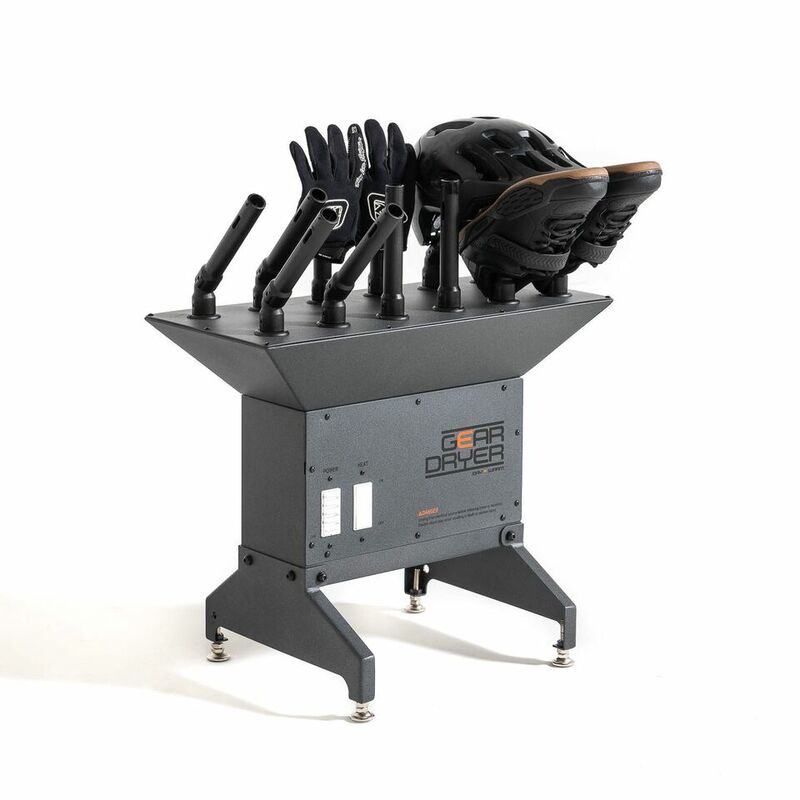 We’re confident that our GearDryer delivers the best performance and value of any boot and glove drying system available. Period.